Sister Faustina was a young, uneducated nun in a convent of the Congregation of Sisters of Our Lady of Mercy in Poland during the 1930s. She came from a poor family that struggled during the years of World War I. She had only three years of simple education, so hers were the humblest tasks in the convent, usually in the kitchen or garden. However, she received extraordinary revelations from our Lord Jesus. Jesus asked Sr. Faustina to record these experiences, which she compiled into notebooks. These notebooks are known today as the Diary of Saint Maria Faustina Kowalska, and the words contained within are God's loving message of Divine Mercy. Though the Divine Mercy message is not new to the teachings of the Church, Sr. Faustina's Diary sparked a great movement, and a strong and significant focus on the mercy of Christ. Saint John Paul II canonized Sr. Faustina in 2000 making her the "first saint of the new millennium." Speaking of Sr. Faustina and the importance of the message contained in her Diary, the Pope call her "the great apostle of Divine Mercy in our time." How is it possible to buy such treasures for so little? I haven't read it straight through yet. I intend to do so at some point. But the sections I have read have been amazing. And there's something about seeing the book on your shelf that brings peace. It's a beautiful cover, even though paperback. We live in difficult times. But God's mercy abounds. One of the ways that we see this immense mercy is in the availability in books like these-- which teach us about this mercy. I could say this about many books on this site, really, but how is it possible to buy such a treasure for so little money?! You can buy this priceless item for the cost of a Subway sandwich. I understand that nonetheless the cost can still be a hindrance to some, but for many, it just requires some ingenuity and sacrifice. Important, powerful, incredible, and beautiful book that will inspire in you the desire to grow in holiness and grow closer to Christ Our Lord. This is a must-read classic for all Catholics. It's filled with many gems. 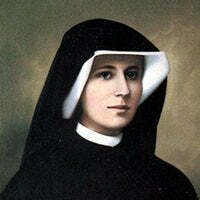 St. Faustina shows, through her encounters with other people and through her own words to us, that one must love the sufferings one encounters because in that way we more closely conform ourselves to Christ and His Passion. It's not the sort of book that you can read through quickly in a couple days. I recommend reading a few pages of it each night before you go to bed because it brings your soul at peace. The book will fill you with zeal and inspire you to say the Divine Mercy Chaplet for the conversion of friends and acquaintances.